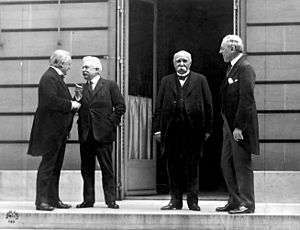 The "Big Four" at the Paris Peace Conference of 1919: David Lloyd George, Vittorio Emanuele Orlando, Georges Clemenceau and Woodrow Wilson. This article covers worldwide diplomacy and, more generally, the international relations of the major powers, from 1814 to 1919, with links to more detailed articles. The international relations of minor countries are covered in their own history articles. This era covers the period from the end of the Napoleonic Wars and the Congress of Vienna (1814–15), to the end of the First World War and the Paris Peace Conference. Important themes include the rapid industrialization and growing power of Britain, Europe and, later in the period, the United States, with Japan emerging as a major power and empire towards the end of this period. This led to imperialist and colonialist competitions for influence and power throughout the world, the impacts of which are still widespread and consequential in the current age. Britain established an informal economic network that, combined with the Royal Navy, made it the most influential nation during this time. The entire era had a general lack of major conflict between the great powers, with most skirmishes taking place between belligerents within the borders of individual countries. In Europe, wars were much smaller, shorter and less frequent than ever before. The quiet century was shattered by World War I (1914–18), which was unexpected in its timing, duration, casualties, and long-term impact. At the beginning of this period, there was an informal convention recognising five Great Powers in Europe: the French Empire, the British Empire, the Russian Empire, the Austrian Empire (later Austria-Hungary) and the Kingdom of Prussia (later the German Empire). In the late 19th century, the newly united Italy was added to this group. By the early 20th century, two non-European states, Japan and the United States of America, would come to be respected as fellow Great Powers. All of them took part in the Boxer Rebellion as the Eight-Nation Alliance and were later involved in the Great War. Having lost the conflict, Germany, Russia and Austria lost their great power status while Britain, France, Italy and Japan gained permanent seats at the League of Nations council. The United States, meant to be the fifth permanent member, left because the US Senate voted on 19 March 1920 against the ratification of the Treaty of Versailles, thus preventing American participation in the League. The national boundaries within Europe as set by the Congress of Vienna, 1815. As the four major European powers (Britain, Prussia, Russia and Austria) opposing the French Empire in the Napoleonic Wars saw Napoleon's power collapsing in 1814, they started planning for the postwar world. The Treaty of Chaumont of March 1814 reaffirmed decisions that had been made already and which would be ratified by the more important Congress of Vienna of 1814–15. They included the establishment of a confederated Germany, the division of French protectorates and annexations into independent states, the restoration of the Bourbon kings of Spain, the enlargement of the Netherlands to include what in 1830 became modern Belgium, and the continuation of British subsidies to its allies. The Treaty of Chaumont united the powers to defeat Napoleon and became the cornerstone of the Concert of Europe, which formed the balance of power for the next two decades. The Congress of Vienna (1814–1815) dissolved the Napoleonic world and attempted to restore the monarchies Napoleon had overthrown, ushering in an era of reaction. Under the leadership of Metternich, the prime minister of Austria (1809–48) and Lord Castlereagh, the foreign minister of Great Britain (1812–22), the Congress set up a system to preserve the peace. Under the Concert of Europe (or "Congress system"), the major European powers—Britain, Russia, Prussia, Austria, and (after 1818) France—pledged to meet regularly to resolve differences. This plan was the first of its kind in European history, and seemed to promise a way to collectively manage European affairs and promote peace. It was the forerunner of the League of Nations and the United Nations but it collapsed by 1823. The Congress resolved the Polish–Saxon crisis at Vienna and the question of Greek independence at Laibach. Three major European congresses took place. The Congress of Aix-la-Chapelle (1818) ended the occupation of France. The others were meaningless as each nation realized the Congresses were not to their advantage, where disputes were resolved with a diminishing degree of effectiveness. The main goal for Tsar Alexander I of Russia was to form a league that could intervene and stop revolutions against monarchies and traditionalism; he had in mind the French Revolution of the 1790s. The British refused to cooperate in a scheme not directly related to British interests. As a result, the Congress system had collapsed by 1822. To achieve lasting peace, the Concert of Europe tried to maintain the balance of power. Until the 1860s the territorial boundaries laid down at the Congress of Vienna were maintained, and even more important there was an acceptance of the theme of balance with no major aggression. Otherwise, the Congress system. says historian Roy Bridge, "failed" by 1823. In 1818 the British decided not to become involved in continental issues that did not directly affect them. They rejected the plan of Tsar Alexander I to suppress future revolutions. The Concert system fell apart as the common goals of the Great Powers were replaced by growing political and economic rivalries. Artz says the Congress of Verona in 1822 "marked the end." There was no Congress called to restore the old system during the great revolutionary upheavals of 1848 with their demands for revision of the Congress of Vienna's frontiers along national lines. British foreign policy was set by George Canning (1822–27), who avoided close cooperation with other powers. Britain, with its unchallenged Royal Navy and increasing financial wealth and industrial strength, built its foreign policy on the principle that no state should be allowed to dominate the Continent. It wanted to support the Ottoman Empire as a bulwark against Russian expansionism. It opposed interventions designed to suppress democracy, and was especially worried that France and Spain planned to suppress the independence movement underway in Latin America. Canning cooperated with the United States to promulgate the Monroe Doctrine to preserve newly independent Latin American states. His goal was to prevent French dominance and allow British merchants access to the opening markets. An important liberal advance was the abolition of the international slave trade. It began with legislation in Britain and the United States in 1807, which was increasingly enforced over subsequent decades by the British Royal Navy under treaties Britain negotiated, or coerced, other nations into agreeing. The result was a reduction of over 95% in the volume of the slave trade from Africa to the New World. About 1000 slaves a year were illegally brought into the United States, as well as some to Cuba and Brazil. Slavery was abolished in the British Empire in 1833, the French Republic in 1848, the United States in 1865, and Brazil in 1888. Spain was at war with Britain from 1798 to 1808, and the British Royal Navy cut off its contacts with its colonies. Trade was handled by neutral American and Dutch traders. The colonies set up temporary governments or juntas which were effectively independent from Spain. The division exploded between Spaniards who were born in Spain (called "peninsulares") versus those of Spanish descent born in New Spain (called "criollos" in Spanish or "creoles" in English) The two groups wrestled for power, with the criollos leading the call for independence and eventually winning that independence. Spain lost all of its American colonies, except Cuba and Puerto Rico, in a complex series of revolts from 1808 to 1826. Multiple revolutions in Latin America allowed the region to break free of the mother country. Repeated attempts to regain control failed, as Spain had no help from European powers. Indeed, Britain and the United States worked against Spain, enforcing the Monroe Doctrine. British merchants and bankers took a dominant role in Latin America, In 1824, the armies of generals José de San Martín of Argentina and Simón Bolívar of Venezuela defeated the last Spanish forces; the final defeat came at the Battle of Ayacucho in southern Peru. After the loss of its colonies, Spain played a minor role in international affairs. Spain kept Cuba, which repeatedly revolted in three wars of independence, culminating in the Cuban War of Independence. The United States demanded reforms from Spain, which Spain refused. 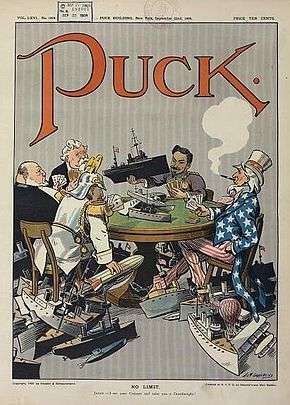 The U.S. intervened by war in 1898. Winning easily, the U.S. took Cuba and gave it independence. The U.S. also took the Spanish colonies of the Philippines and Guam. Though it still had small colonial holdings in North Africa, Spain's role in international affairs was essentially over. The Greek War of Independence was the major military conflict in the 1820s. The Great powers supported the Greeks, but did not want the Ottoman Empire destroyed. Greece was initially to be an autonomous state under Ottoman suzerainty, but by 1832, in the Treaty of Constantinople, it was recognized as a fully independent kingdom. After some initial success the Greek rebels were beset by internal disputes. The Ottomans, with major aid from Egypt, cruelly crushed the rebellion and harshly punished the Greeks. Humanitarian concerns in Europe were outraged, as typified by English poet Lord Byron. The context of the three Great Powers' intervention was Russia's long-running expansion at the expense of the decaying Ottoman Empire. However Russia's ambitions in the region were seen as a major geostrategic threat by the other European powers. Austria feared the disintegration of the Ottoman Empire would destabilize its southern borders. Russia's gave strong emotional support for the fellow-Orthodox Christian Greeks. The British were motivated by strong public support for the Greeks. Fearing unilateral Russian action in support of the Greeks, Britain and France bound Russia by treaty to a joint intervention which aimed to secure Greek autonomy whilst preserving Ottoman territorial integrity as a check on Russia. The Powers agreed, by the Treaty of London (1827), to force the Ottoman government to grant the Greeks autonomy within the empire and despatched naval squadrons to Greece to enforce their policy. 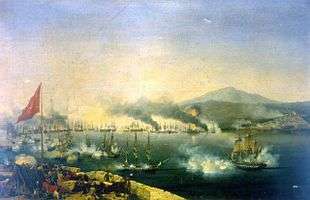 The decisive Allied naval victory at the Battle of Navarino broke the military power of the Ottomans and their Egyptian allies. Victory saved the fledgling Greek Republic from collapse. But it required two more military interventions, by Russia in the form of the Russo-Turkish War of 1828–9 and by a French expeditionary force to the Peloponnese to force the withdrawal of Ottoman forces from central and southern Greece and to finally secure Greek independence. RMS Lusitania arriving in New York from Liverpool, England, in 1907. As the primary means of trans-oceanic voyages for over a century, ocean liners handled the travel needs of businessmen, immigrants and tourists. The world became much smaller as long-distance travel and communications improved dramatically. Every decade there were more ships, more scheduled destinations, faster trips, and lower fares for passengers and cheaper rates for merchandise. This facilitated international trade and international organization. Hornet – an American clipper ship of the 1850s. Underwater telegraph cables linked the world's major trading nations by the 1860s. The clipper was a very fast sailing ship of the 1843-69 era. Clippers were narrow for their length, could carry limited bulk freight, small by later 19th century standards, and had a large total sail area. They sailed all over the world, primarily on the trade routes between Britain and its colonies in the east, in trans-Atlantic trade, and the New York-to-San Francisco route round Cape Horn during the California Gold Rush. The steam-powered, iron-hulled ocean liner became the dominant mode of passenger transportation from the 1850s to the 1950s. Freight rates on ocean traffic held steady in the 18th century down to about 1840, and then began a rapid downward plunge. The British dominated world exports and rates for British freight fell 70 percent, from 1840 to 1910. The Suez Canal cut the shipping time from London to India by a third when it opened in 1869. The same ship could make more voyages in a year, so it could charge less and carry more goods every year. Technological innovation was steady. Iron hulls replaced wood by mid-century; after 1870, steel replaced iron. It took much longer for steam engines to replace sails. Note the sailing ship across from the Lusitania in the photograph above. Wind was free, and could move the ship at 2-3 knots, unless it was becalmed. Coal was expensive and required coaling stations along the route. A common solution was for a merchant ship to rely mostly on its sails, and only use the steam engine as a backup. The first steam engines were very inefficient, using a great deal of coal. For an ocean voyage in the 1860s, half of the cargo space was given over to coal. The problem was especially acute for warships, because their combat range using coal was strictly limited. Only the British Empire had a network of coaling stations that permitted a global scope for the Royal Navy. Steady improvement gave high-powered compound engines which were much more efficient. The boilers and pistons were built of steel, which could handle much higher pressures than iron. They were first used for high-priority cargo, such as mail and passengers. The arrival of the steam turbine engine around 1907 dramatically improved efficiency, and the increasing use of oil after 1910 meant far less cargo space had to be devoted to the fuel supply. By the 1850s, railways and telegraph lines connected all the major cities inside Western Europe, as well as those inside the United States. Instead of greatly reducing the need for travel, the telegraph made travel easier to plan and replaced the slow long-distance mail service. Submarine cables were laid to link the continents by telegraph, which was a reality by the 1860s. Britain continued as the most important power, followed by Russia, France, Prussia and Austria. The United States was growing rapidly in size, population and economic strength, especially after its defeat of Mexico in 1848. Otherwise it avoided international entanglements as the slavery issue became more and more divisive. The Crimean War was the most important war, especially because it disrupted the stability of the system. Britain strengthened its colonial system especially in India, while France rebuilt its empire in Asia and North Africa. Russia continued its expansion south (toward Persia) and east (into Siberia). The Ottoman Empire steadily weakened, losing control in parts of the Balkans to the new states of Greece and Serbia. In the Treaty of London, signed in 1839, the Great Powers guaranteed the neutrality of Belgium. Germany called it a "scrap of paper" and violated it in 1914 by invasion, whereupon Britain declared war on Germany. From 1830 to 1865, with a few interruptions, Lord Palmerston set British foreign policy. His goal was to keep Britain dominant by maintaining the balance of power in Europe. He cooperated with France when necessary, but did not make permanent alliances with anyone. He tried to keep autocratic nations like Russia and Austria in check; he supported liberal regimes because they led to greater stability in the international system. However he also supported the autocratic Ottoman Empire because it blocked Russian expansion. Episode of the Belgian Revolution of 1830, by Gustaf Wappers (1834). Catholic Belgians in 1830 broke away from the United Kingdom of the Netherlands and established an independent Kingdom of Belgium. They could not accept the Dutch's king's favouritism toward Protestantism and his disdain for the French language. Outspoken liberals regarded King William I's rule as despotic. There were high levels of unemployment and industrial unrest among the working classes. There was small-scale fighting but it took years before the Netherlands finally recognized defeat. In 1839 the Dutch accepted Belgian independence by signing the Treaty of London. The major powers guaranteed Belgian independence. The Ottoman Empire was only briefly involved in the Napoleonic Wars through the French campaign in Egypt and Syria, 1798–1801. It was not invited to the Vienna Conference. During this period the Empire steadily weakened militarily, and lost most of its holdings in Europe (starting with Greece) and later in North Africa. Its great enemy was Russia, while its chief supporter was Britain. As the 19th century progressed the Ottoman Empire grew weaker and Britain increasingly became its chief ally and protector, even fighting the Crimean War in the 1850s to help it out against Russia. Three British leaders played major roles. Lord Palmerston in the 1830-65 era considered the Ottoman Empire an essential component in the balance of power, was the most favourable toward Constantinople. William E. Gladstone in the 1870s sought to build a Concert of Europe that would support the survival of the empire. In the 1880s and 1890s Lord Salisbury contemplated an orderly dismemberment of it, in such a way as to reduce rivalry between the greater powers. The Principality of Serbia in 1817. The Crimean War (1853–56) was fought between Russia on the one hand and an alliance of Great Britain, France, Sardinia, and the Ottoman Empire on the other. Russia was defeated. In 1851 France under Napoleon III compelled the Sublime Porte (the Ottoman or Turkish government) to recognize it as the protector of Christian sites in the Holy Land. Russia denounced this claim, since it claimed to be the protector of all Eastern Orthodox Christians in the Ottoman Empire. France sent its fleet to the Black Sea; Russia responded with its own show of force. In 1851, Russia sent troops into the Ottoman provinces of Moldavia and Wallachia. Britain, now fearing for the security of the Ottoman Empire, sent a fleet to join with the French expecting the Russians would back down. Diplomatic efforts failed. The Sultan declared war against Russia in October 1851. Following an Ottoman naval disaster in November, Britain and France declared war against Russia. Most of the battles took place in the Crimean peninsula, which the Allies finally seized. London, shocked to discover that France was secretly negotiating with Russia to form a postwar alliance to dominate Europe, dropped its plans to attack St. Petersburg and instead signed a one-sided armistice with Russia that achieved almost none of its war aims. 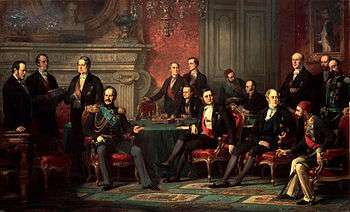 Diplomats at the Congress of Paris, 1856, settled the Crimean War; painting by Edouard Louis Dubufe. The Treaty of Paris signed March 30, 1856, ended the war. It admitted the Ottoman Empire to the European concert, and the Powers promised to respect its independence and territorial integrity. Russia gave up a little land and relinquished its claim to a protectorate over the Christians in the Ottoman domains. The Black Sea was demilitarized, and an international commission was set up to guarantee freedom of commerce and navigation on the Danube River. Moldavia and Wallachia remained under nominal Ottoman rule, but would be granted independent constitutions and national assemblies. New rules of wartime commerce were set out: (1) privateering was illegal; (2) a neutral flag covered enemy goods except contraband; (3) neutral goods, except contraband, were not liable to capture under an enemy flag; (4) a blockade, to be legal, had to be effective. The war helped modernize warfare by introducing major new technologies such as railways, the telegraph, and modern nursing methods. In the long run the war marked a turning point in Russian domestic and foreign policy. Russian intellectuals used the defeat to demand fundamental reform of the government and social system. The war weakened both Russia and Austria, so they could no longer promote stability. This opened the way for Napoleon III, Cavour (in Italy) and Otto von Bismarck (in Germany) to launch a series of wars in the 1860s that reshaped Europe. Moldavia, Wallachia and Transylvania in 1812. 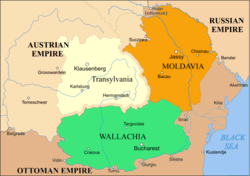 In 1859 Moldavia and Wallachia formed Romania, and acquired Transylvania in 1918. In a largely peaceful transition, the Ottoman provinces of Moldavia and Wallachia broke away slowly, achieved effective autonomy by 1859, and finally became officially an independent nation in 1878. The two provinces had long been under Ottoman control, but both Russia and Austria also wanted them, making the region a major cockpit for wars in the 19th century. The population was largely Orthodox in religion and spoke Romanian, but there were many minorities, such as Jews and Greeks. The provinces were occupied by Russia after the Treaty of Adrianople in 1829. Russian and Turkish troops combined to suppress the Wallachian Revolution of 1848. During the Crimean War Austria took control. The population decided on unification on the basis of historical, cultural and ethnic connections. It took effect in 1859 after the double election of Alexandru Ioan Cuza as Ruling Prince of the United Principalities of Moldavia and Wallachia (renamed of Romania in 1862). Romania officially became independent in 1878, but focused its attention on Transylvania, a province of Hungary with about 2 million Romanians. Finally when the Austro-Hungarian Empire collapsed at the end of the First World War, Romania obtained Transylvania. In 1859, following another short-lived Conservative government, Prime Minister Lord Palmerston and Earl Russell made up their differences, and Russell consented to serve as Foreign Secretary in a new Palmerston cabinet. It was the first true Liberal Cabinet. This period was a particularly eventful one in the world outside Britain, seeing the Unification of Italy, the Diplomacy of the American Civil War, and the 1864 war over Schleswig-Holstein between Denmark and the German states. Russell and Palmerston kept Britain neutral in every case. Despite his promises in 1852 of a peaceful reign, Napoleon III could not resist the temptations of glory in foreign affairs. He was visionary, mysterious and secretive; he had a poor staff, and kept running afoul of his domestic supporters. In the end he was incompetent as a diplomat. After a brief threat of an invasion of Britain in 1851, France and Britain cooperated in the 1850s, with an alliance in the Crimean War, and a major trade treaty in 1860. However Britain viewed the Second Empire of Napoleon III with increasing distrust, especially as the emperor built up his navy, expanded his empire and took up a more active foreign policy. Napoleon III did score some successes: he strengthened French control over Algeria, established bases in Africa, began the takeover of Indochina, and opened trade with China. He facilitated a French company building the Suez Canal, which Britain could not stop. In Europe, however, Napoleon failed again and again. The Crimean war of 1854–1856 produced no gains. War with Austria in 1859 facilitated the unification of Italy, and Napoleon was rewarded with the annexation of Savoy and Nice. The British grew annoyed at his intervention in Syria in 1860–61. He angered Catholics alarmed at his poor treatment of the Pope, then reversed himself and angered the anticlerical liberals at home and his erstwhile Italian allies. He lowered the tariffs, which helped in the long run but in the short run angered owners of large estates and the textile and iron industrialists, while leading worried workers to organize. Matters grew worse in the 1860s as Napoleon nearly blundered into war with the United States in 1862, while his Mexican intervention in 1861–1867 was a total disaster. Finally in the end he went to war with the Germans in 1870 when it was too late to stop German unification. Napoleon had alienated everyone; after failing to obtain an alliance with Austria and Italy, France had no allies and was bitterly divided at home. It was disastrously defeated on the battlefield, losing Alsace and Lorraine. A.J.P. Taylor is blunt: "he ruined France as a great power." The stages of Italian unification between 1829–71. The Risorgimento was the era 1830–1870 that saw the emergence of a national consciousness. Italians achieved independence from Austria and from the Pope, securing national unification. The papacy secured French backing to resist unification, fearing that giving up control of the Papal States would weaken the Church and allow the liberals to dominate conservative Catholics. The newly united Italy was recognized as the sixth great power. During the American Civil War (1861–1865), the Southern slave states attempted to secede from the Union and set up an independent country, the Confederate States of America. The North would not accept this affront of American nationalism, and fought to restore the Union. British and French aristocratic leaders personally disliked American republicanism and favored the more aristocratic Confederacy. The South was also by far the chief source of cotton for European textile mills. The goal of the Confederacy was to obtain British and French intervention, that is, war against the Union. Confederates believed (with scant evidence) that "cotton is king"—that is, cotton was so essential to British and French industry that they would fight to get it. The Confederates did raise money in Europe, which they used to buy warships and munitions. However Europe had a surplus of cotton in 1862; stringency did not come until 1862, and meanwhile Britain depended heavily on American grain. France would not intervene alone, and in any case was less interested in cotton than in securing its control of Mexico. The Confederacy would allow that if it secured its independence, but the Union never would approve. Washington made it clear that any official recognition of the Confederacy meant war with the U.S.
Queen Victoria's husband Prince Albert helped defuse a war scare in late 1861. The British people, who depended heavily on American food imports, generally favored the United States. What little cotton was available came from New York City, as the blockade by the U.S. Navy shut down 95% of Southern exports to Britain. In September 1862, during the Confederate invasion of Maryland, Britain (along with France) contemplated stepping in and negotiating a peace settlement, which could only mean war with the United States. But in the same month, US president Abraham Lincoln announced the Emancipation Proclamation. Since support of the Confederacy now meant support for slavery, there was no longer any possibility of European intervention. Meanwhile, the British sold arms to both sides, built blockade runners for a lucrative trade with the Confederacy, and surreptitiously allowed warships to be built for the Confederacy. The warships caused a major diplomatic row that was resolved in the Alabama Claims in 1872, in the Americans' favor. A major diplomatic row, and several wars, emerged from the very complex situation in Schleswig and Holstein, where Danish and German claims collided, and Austria and France became entangled. The Danish and German duchies of Schleswig-Holstein were, by international agreement, ruled by the king of Denmark but were not legally part of Denmark. An international treaty provided that the two territories were not to be separated from each other, though Holstein was part of the German Confederation. In the late 1840s, with both German and Danish nationalism on the rise, Denmark attempted to incorporate Schleswig into its kingdom. The first war was a Danish victory. The Second Schleswig War of 1864 was a Danish defeat at the hands of Prussia and Austria. The two victors then split control of the two territories. That led to conflict between them, resolved by the Austro-Prussian War of 1866, which Prussia quickly won. Austria now dropped to the second rank among the Great Powers. Emperor Napoleon III of France could not tolerate the rapid rise of Prussia, and started the Franco-Prussian War of 1870–71 over trivialities. The spirit of German nationalism caused the smaller German states (such as Bavaria and Saxony) to join the war alongside Prussia. The German coalition won an easy victory, dropping France to second class status among the Great Powers. Prussia, under Otto von Bismarck, then brought together almost all the German states (excluding Austria) into a new German Empire. Bismarck's new empire became the most powerful state in continental Europe until 1914. 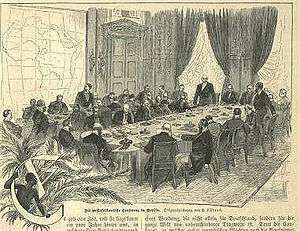 The Berlin Conference (1884) chaired by German Chancellor Otto von Bismarck regulated European imperialism in Africa. Most of the major powers (and some minor ones such as Belgium, the Netherlands and Denmark) engaged in imperialism, building up their overseas empires especially in Africa and Asia. Although there were numerous insurrections, historians count only a few wars, and they were small-scale: two Anglo-Boer Wars (1880–1881 and 1899–1902), the Sino-Japanese War (1894–1895), First Italo-Ethiopian War (1895–96), Spanish–American War (1898), and Italo-Ottoman war (1911). The largest was the Russo-Japanese War of 1905, and it was the only one that saw two major powers fighting each other. Napoleon III took advantage of the American Civil War. Spain, Britain and France, angry over unpaid Mexican debts, sent a joint expeditionary force that seized the Veracruz customs house in Mexico in December 1861. Spain and Britain soon withdrew after realizing that Napoleon III intended to overthrow the Mexican government under elected president Benito Juárez and establish a Second Mexican Empire. 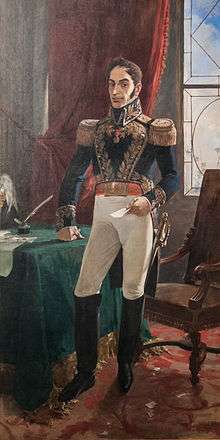 Napoleon had the support of the remnants of the Conservative elements that Juarez and his Liberals had defeated in the Reform War, a civil war of 1857–61. In the French intervention in Mexico in 1862. Napoleon installed Austrian archduke Maximilian of Habsburg as emperor of Mexico. Juárez rallied opposition to the French; Washington supported Juárez and refused to recognize the new government because it violated the Monroe Doctrine. After its total victory over the Confederacy in 1865, the U.S. sent 50,000 experienced combat troops to the Mexican border to make clear its position. Napoleon was stretched very thin; he had committed 40,000 troops to Mexico, 20,000 to Rome to guard the Pope against the Italians, and another 80,000 in restive Algeria. Furthermore, Prussia, having just defeated Austria, was an imminent threat. Napoleon realized his predicament and withdrew all his forces from Mexico in 1866. Juarez regained control and executed the hapless emperor. In 1892, the Senegalese Tirailleurs, led by Colonel Alfred-Amédée Dodds, invaded Dahomey (present-day Benin). The Suez Canal, initially built by the French, became a joint British-French project in 1875, as both saw it as vital to maintaining their influence and empires in Asia. In 1882, ongoing civil disturbances in Egypt prompted Britain to intervene, extending a hand to France. France's leading expansionist Jules Ferry was out of office, and the government allowed Britain to take effective control of Egypt. 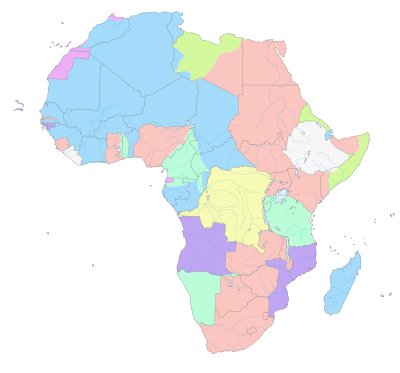 Areas of Africa controlled by colonial powers in 1913, shown along with current national boundaries. In the "scramble for Africa," Britain and France, as well as Germany, Italy and Portugal, greatly expanded their colonial empires in Africa. The King of Belgium personally controlled the Congo. Bases along the coast become the nucleus of colonies that stretch inland. In British colonies, workers and businessmen from India were brought in to build railways, plantations and other enterprises. Central and east Africa, 1898, during the Fashoda Incident. Tensions between Britain and France reached tinder stage in Africa. At several points war was possible, but never happened. The most serious episode was the Fashoda Incident of 1898. French troops tried to claim an area in the Southern Sudan, and a British force purporting to be acting in the interests of the Khedive of Egypt arrived to confront them. Under heavy pressure the French withdrew securing Anglo-Egyptian control over the area. The status quo was recognised by an agreement between the two states acknowledging British control over Egypt, while France became the dominant power in Morocco, but France suffered a humiliating defeat overall. The Ottoman Empire lost its nominal control over Algeria, Tunisia and Libya. It retained only nominal control of Egypt. In 1875 Britain purchased the Suez canal shares from the almost bankrupt khedive of Egypt, Isma'il Pasha. The experience of Kenya is representative of the colonization process in East Africa. By 1850 European explorers had begun mapping the interior. Three developments encouraged European interest in East Africa. First was the emergence of the island of Zanzibar, located off the east coast. It became a base from which trade and exploration of the African mainland could be mounted. By 1840, to protect the interests of the various nationals doing business in Zanzibar, consul offices had been opened by the British, French, Germans and Americans. In 1859, the tonnage of foreign shipping calling at Zanzibar had reached 19,000 tons. By 1879, the tonnage of this shipping had reached 89,000 tons. The second development spurring European interest in Africa was the growing European demand for products of Africa including ivory and cloves. Thirdly, British interest in East Africa was first stimulated by their desire to abolish the slave trade. Later in the century, British interest in East Africa was stimulated by German competition, and in 1887 the Imperial British East Africa Company, a private concern, leased from Seyyid Said his mainland holdings, a 10-mile (16-km)-wide strip of land along the coast. Germany set up a protectorate over the Sultan of Zanzibar's coastal possessions in 1885. It traded its coastal holdings to Britain in 1890, in exchange for German control over the coast of Tanganyika. In 1895 the British government claimed the interior as far west as Lake Naivasha; it set up the East Africa Protectorate. The border was extended to Uganda in 1902, and in 1920 most of the enlarged protectorate became a crown colony. With the beginning of colonial rule in 1895, the Rift Valley and the surrounding Highlands became the enclave of white immigrants engaged in large-scale coffee farming dependent on mostly Kikuyu labour. There were no significant mineral resources—none of the gold or diamonds that attracted so many to South Africa. In the initial stage of colonial rule, the administration relied on traditional communicators, usually chiefs. When colonial rule was established and efficiency was sought, partly because of settler pressure, newly educated younger men were associated with old chiefs in local Native Councils. 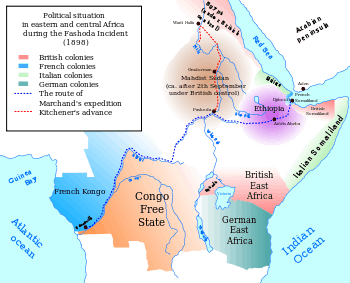 Following severe financial difficulties of the British East Africa Company, the British government on 1 July 1895 established direct rule through the East African Protectorate, subsequently opening (1902) the fertile highlands to white settlers. A key to the development of Kenya's interior was the construction, started in 1895, of a railway from Mombasa to Kisumu, on Lake Victoria, completed in 1901. Some 32,000 workers were imported from British India to do the manual labour. Many stayed, as did most of the Indian traders and small businessmen who saw opportunity in the opening up of the interior of Kenya. Portugal, a small poor agrarian nation with a strong seafaring tradition, built up a large empire, and kept it longer than anyone else by avoiding wars and remaining largely under the protection of Britain. In 1899 it renewed its Treaty of Windsor with Britain originally written in 1386. Energetic explorations in the sixteenth century led to a settler colony in Brazil. Portugal also established trading stations open to all nations off the coasts of Africa, South Asia, and East Asia. Portugal had imported slaves as domestic servants and farm workers in Portugal itself, and used its experience to make slave trading a major economic activity. Portuguese businessmen set up slave plantations on the nearby islands of Madeira, Cape Verde, and the Azores, focusing on sugar production. In 1770, the enlightened despot Pombal declared trade to be a noble and necessary profession, allowing businessmen to enter the Portuguese nobility. Many settlers moved to Brazil, which became independent in 1822. After 1815, the Portuguese expanded their trading ports along the African coast, moving inland to take control of Angola and Portuguese East Africa (Mozambique). The slave trade was abolished in 1836, in part because many foreign slave ships were flying the Portuguese flag. In India, trade flourished in the colony of Goa, with its subsidiary colonies of Macau, near Hong Kong on the China coast, and Timor, north of Australia. The Portuguese successfully introduced Catholicism and the Portuguese language into their colonies, while most settlers continued to head to Brazil. In the Scramble for Africa of the 1880s, leaders of the new nation of Italy were enthusiastic about acquiring colonies in Africa, expecting it would legitimize their status as a power and help unify the people. In North Africa Italy first turned to Tunis, under nominal Ottoman control, where many Italian farmers had settled. Weak and diplomatically isolated, Italy was helpless and angered when France assumed a protectorate over Tunis in 1881. Turning to East Africa, Italy tried to conquer independent Ethiopia, but was massively defeated at the Battle of Adwa in 1896. Public opinion was angered at the national humiliation by an inept government. In 1911 the Italian people supported the seizure of what is now Libya. Italian diplomacy over a twenty-year period succeeded in getting permission to seize Libya, with approval coming from Germany, France, Austria, Britain and Russia. A centerpiece of the Italo-Turkish War of 1911–12 came when Italian forces took control of a few coastal cities against stiff resistance by Ottoman troops as well as the local tribesmen. After the peace treaty gave Italy control it sent in Italian settlers, but suffered extensive casualties in its brutal campaign against the tribes. Starting in the 1860s Japan rapidly modernized along Western lines, adding industry, bureaucracy, institutions and military capabilities that provided the base for imperial expansion into Korea, China and islands to the South. It saw itself vulnerable to aggressive Western imperialism unless it took control of neighboring areas. It took control of Okinawa and Formosa. Japan's desire to control Taiwan, Korea and Manchuria, led to the first Sino-Japanese War with China in 1894–1895 and the Russo-Japanese War with Russia in 1904–1905. The war with China made Japan the world's first Eastern, modern imperial power, and the war with Russia proved that a Western power could be defeated by an Eastern state. The aftermath of these two wars left Japan the dominant power in the Far East with a sphere of influence extending over southern Manchuria and Korea, which was formally annexed as part of the Japanese Empire in 1910. Okinawa is the largest of the Ryukyu Islands, and paid tribute to China from the late 14th century. Japan took control of the entire Ryukyu island chain in 1879 and integrated it into Japan. The island of Formosa (Taiwan) had an indigenous population when Dutch traders in need of an Asian base to trade with Japan and China arrived in 1623. The Dutch East India Company (VOC) built Fort Zeelandia. They soon began to rule the natives. China took control in the 1660s, and sent in settlers. By the 1890s there were about 2.3 million Han Chinese and 200,000 members of indigenous tribes. After its victory in the First Sino-Japanese War in 1894–95, the peace treaty ceded the island to Japan. It was Japan's first colony. Japan expected far more benefits from the occupation of Taiwan than the limited benefits it actually received. Japan realized that its home islands could only support a limited resource base, and it hoped that Taiwan, with its fertile farmlands, would make up the shortage. By 1905, Taiwan was producing rice and sugar and paying for itself with a small surplus. Perhaps more important, Japan gained Asia-wide prestige by being the first non-European country to operate a modern colony. It learned how to adjust its German-based bureaucratic standards to actual conditions, and how to deal with frequent insurrections. The ultimate goal was to promote Japanese language and culture, but the administrators realized they first had to adjust to the Chinese culture of the people. Japan had a civilizing mission, and it opened schools so that the peasants could become productive and patriotic manual workers. Medical facilities were modernized, and the death rate plunged. To maintain order, Japan installed a police state that closely monitored everyone. In 1945, Japan was stripped of its empire and Taiwan was returned to China. In 1905, the Empire of Japan and the Korean Empire signed the Eulsa Treaty, which brought Korea into the Japanese sphere of influence as a protectorate. The Treaty was a result of the Japanese victory in the Russo-Japanese War and Japan wanting to increase its hold over the Korean Peninsula. The Eulsa Treaty led to the signing of the 1907 Treaty two years later. The 1907 Treaty ensured that Korea would act under the guidance of a Japanese resident general and Korean internal affairs would be under Japanese control. Korean Emperor Gojong was forced to abdicate in favour of his son, Sunjong, as he protested Japanese actions in the Hague Conference. Finally in 1910, the Annexation Treaty was signed, formally annexing Korea to Japan. Officially, China remained a unified country. In practice, European powers and Japan took effective control of certain port cities and their surrounding areas from the middle nineteenth century until the 1920s. Technically speaking, they exercised "extraterritoriality" that was imposed in a series of unequal treaties. In Britain the Liberals were not so naive and idealistic as to reject the imperial heritage; many Liberals such as H. H. Asquith became active imperialists. Liberal Party policy around 1880 was shaped by William E. Gladstone as he repeatedly attacked Disraeli's imperialism. On the other hand, national interest was always paramount, and the Liberals were quick to seek common ground with the Conservatives in regard to the Berlin Treaty, in which the party lost the moral high ground as a critic of imperialism. Britain, in addition to taking control of new territories, developed an enormous power in economic and financial affairs in numerous independent countries, especially in Latin America and Asia. It lent money, built railways, and engaged in trade. The Great London Exhibition of 1851 clearly demonstrated Britain's dominance in engineering, communications and industry; that lasted until the rise of the United States and Germany in the 1890s. In 1890–1902 under Salisbury, Britain promoted a policy of Splendid isolation with no formal allies. Britain and Germany each tried to improve relations, but British distrust of the Kaiser ran deep. The main accomplishment was an 1890 treaty that exchanged Germany's Zanzibar colony in Africa for the Heligoland islands, off Hamburg, which were essential to the security of Germany's ports. The Kaiser did indeed meddle in Africa in support of the Boers, which soured relations. British-French relations took a turn for worse when France declared war on Siam in 1893, which London saw as a threat to India. 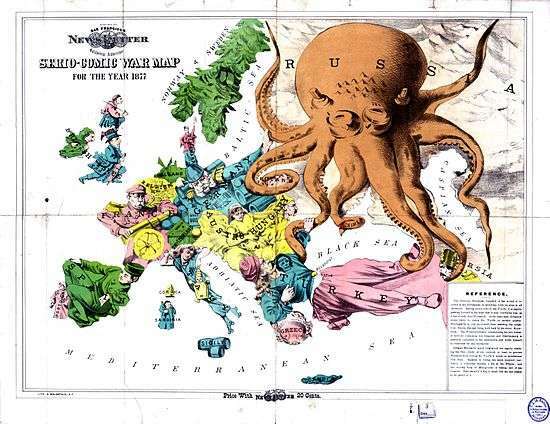 "The Russian menace: a Serio-Comic War Map for the Year 1877" an English cartoon from 1877 showing Russia as a monstrous octopus devouring neighbouring lands, especially the Ottoman Empire. The "Eastern Question" involved the slow steady disintegration of the "Sick man of Europe" (the Ottoman Empire, often called "Turkey"), the rise of nationalism in the Balkans, and the general issue of alliances in Eastern Europe. In the 1870s the "Eastern Question" focused on the mistreatment of Christians in the Balkans by the Ottoman Empire, and what the European great powers ought to do about it. In 1876 Serbia and Montenegro declared war on Turkey, and were badly defeated, notably at the battle of Alexinatz (Sept. 1, 1876). Gladstone published an angry pamphlet on "The Bulgarian Horrors and the Question of the East," which aroused enormous agitation in Britain against Turkish misrule, and complicated the Disraeli government's policy of supporting Turkey against Russia. Russia, which supported Serbia, threatened war against Turkey. In August 1877, Russia declared war on Turkey, and steadily defeated its armies. In early January 1878 Turkey asked for an armistice; the British fleet arrived at Constantinople too late. Russia and Turkey on March 3 signed the Treaty of San Stefano, which was highly advantageous to Russia, Serbia, and Montenegro, as well as Romania and Bulgaria. Britain, France, and Austria opposed the Treaty of San Stefano because it gave Russia too much influence in the Balkans, where insurrections were frequent. War threatened. After numerous attempts a grand diplomatic settlement was reached at the Congress of Berlin (June–July 1878). The new Treaty of Berlin revised the earlier treaty. Germany's Otto von Bismarck (1815–98) presided over the congress and brokered the compromises. One result was that Austria took control of the provinces of Bosnia and Herzegovina, intending to eventually merge them into the Austro-Hungarian Empire. When they finally tried to do that in 1914, local Serbs assassinated Austria's Archduke and the result was the First World War. Britain stayed aloof from alliances in the late 19th century, with an independence made possible by its island location, its dominant navy, its dominant position in finance and trade, and its strong industrial base. It rejected tariffs and practiced free trade. After losing power in Britain in 1874, Liberal leader Gladstone returned to center stage in 1876 by calling for a moralistic foreign policy, as opposed to the realism of his great adversary Benjamin Disraeli. The issue drew the party line between Gladstone's Liberals (who denounced the immoral Ottomans) and Disraeli's Conservatives (who downplayed the atrocities and supported the Ottoman Empire as an offset to Russian power). Disraeli had threatened war with Russia on the issue and Gladstone argued he was wrong. Liberal opinion was convulsed by atrocities in the Balkans, in particular the massacre of more than 10,000 Christian Bulgars by Turkish irregulars. Gladstone denounced the Turks as "abominable and bestial lusts ... at which Hell itself might almost blush" and demanded they withdraw from European soil. The pamphlet sold an astonishing 200,000 copies. The climax was his "Midlothian campaign" of 1880 when he charged Disraeli's government with financial incompetency, neglecting domestic legislation, and mismanagement of foreign affairs. Gladstone felt a call from God to aid the Serbians and Bulgarians (who were Eastern Orthodox Christians); he spoke out like some ancient Hebrew prophet denouncing tyranny and oppression. The real audience was not the local electorate but Britain as a whole, especially the evangelical elements. By appealing to vast audiences denouncing Disraeli's pro-Turkish foreign policy, Gladstone made himself a moral force in Europe, unified his party, and was carried back to power. Chancellor Bismarck took full charge of German foreign policy from 1870 to his dismissal in 1890. His goal was a peaceful Europe, based on the balance of power, with Germany playing a central role; his policy was a success. Germany had the strongest economy on the Continent and the strongest military. Bismarck made clear to all that Germany had no wish to add any territory in Europe, and he tried to oppose German colonial expansion. Bismarck feared that a hostile combination of Austria, France and Russia could overwhelm Germany. If two of them were allied, then the third would ally with Germany only if Germany conceded excessive demands. The solution was to ally with two of the three. In 1873 he formed the League of the Three Emperors, an alliance of the kaiser of Germany, the tsar of Russia, and the emperor of Austria-Hungary. Together they would control Eastern Europe, making sure that restive ethnic groups such as the Poles were kept in control. The Balkans posed a more serious issue, and Bismarck's solution was to give Austria predominance in the western areas, and Russia in the eastern areas. The system collapsed in 1887. Kaiser Wilhelm ousted Bismarck in 1890 and developed his own aggressive foreign policy. The Kaiser rejected the Russian alliance, and Russia in turn turned to an alliance with France. Between 1873 and 1877, Germany repeatedly intervened in the internal affairs of France's neighbors. In Belgium, Spain, and Italy, Bismarck exerted strong and sustained political pressure to support the election or appointment of liberal, anticlerical governments. This was part of an integrated strategy to promote republicanism in France by strategically and ideologically isolating the clerical-monarchist regime of President Patrice de Mac-Mahon. It was hoped that by ringing France with a number of liberal states, French republicans could defeat MacMahon and his reactionary supporters. The modern concept of containment provides a useful model for understanding the dynamics of this policy. Containment almost got out of hand in 1875 in the "War in Sight" crisis. It was sparked by an editorial entitled "Krieg-in-Sicht" in an influential Berlin newspaper the Post. It indicated some highly influential Germans, alarmed by France's rapid recovery from defeat in 1871 and its rearmament program, talked of launching a preventive war against France to hold it down. There was a war scare in Germany and France, and Britain and Russia made it clear they would not tolerate a preventive war. Bismarck did not want any war either, but the unexpected crisis forced him to take into account the fear and alarm that his bullying and Germany's fast-growing power was causing among its neighbors. The crisis reinforced Bismarck's determination that Germany had to work in proactive fashion to preserve the peace in Europe, rather than passively let events take their own course and react to them. The central development in Russian foreign policy was to move away from Germany and toward France. Russia had never been friendly with France, and remembered the wars in the Crimea and the Napoleonic invasion; it saw Paris as a dangerous font of subversion and ridiculed the weak governments there. France, which had been shut out of the entire alliance system by Bismarck, decided to improve relations with Russia. It lent money to the Russians, expanded trade, and began selling warships after 1890. Meanwhile, after Bismarck lost office in 1890, there was no renewal of the Reinsurance treaty between Russia and Germany. The German bankers stopped lending to Russia, which increasingly depended on Paris banks. In 1894 a secret treaty stipulated that Russia would come to the aid of France if France was attacked by Germany. Another stipulation was that in a war against Germany, France would immediately mobilize 1.3 million men, while Russia would mobilize 700,000 to 800,000. It provided that if any of the Triple Alliance (Germany, Austria, Italy) mobilized its reserves in preparation for war, then both Russia and France would mobilize theirs. "The mobilization is the declaration of war," the French chief of staff told Tsar Alexander III in 1892. "To mobilize is to oblige one's neighbor to do the same." This set up the tripwire for July 1914. George F. Kennan argues that Russia was primarily responsible for the collapse of Bismarck's alliance policy in Europe, and starting the downward slope to the First World War. Kennan blames poor Russian diplomacy centered on its ambitions in the Balkans. Kennan says Bismarck's foreign policy was designed to prevent any major war even in the face of improved Franco-Russian relations. Russia left Bismarck's Three Emperors' League (with Germany and Austria) and instead took up the French proposal for closer relationships and a military alliance. The continuing collapse of the Ottoman Empire led to two wars in the Balkans, in 1912 and 1913, which in turn was a prelude to world war. By 1900 nation states had formed in Bulgaria, Greece, Montenegro and Serbia. Nevertheless, many of their ethnic compatriots lived under the control of the Ottoman Empire. In 1912, these countries formed the Balkan League. There were three main causes of the First Balkan War. The Ottoman Empire was unable to reform itself, govern satisfactorily, or deal with the rising ethnic nationalism of its diverse peoples. Secondly, the Great Powers quarreled among themselves and failed to ensure that the Ottomans would carry out the needed reforms. This led the Balkan states to impose their own solution. Most important, the members of the Balkan League were confident that it could defeat the Turks. Their prediction was accurate, as Constantinople called for terms after six weeks of fighting. The First Balkan War broke out when the League attacked the Ottoman Empire on 8 October 1912 and was ended seven months later by the Treaty of London. After five centuries, the Ottoman Empire lost virtually all of its possessions in the Balkans. The Treaty had been imposed by the Great Powers, and the victorious Balkan states were dissatisfied with it. Bulgaria was dissatisfied over the division of the spoils in Macedonia, made in secret by its former allies, Serbia and Greece, and attacked them in order to force them out of Macedonia . The Serbian and Greek armies repulsed the Bulgarian offensive and counter-attacked into Bulgaria, while Romania and the Ottoman Empire also attacked Bulgaria and gained (or regained) territory. In the resulting Treaty of Bucharest, Bulgaria lost most of the territories it had gained in the First Balkan War. The long-term result was heightened tension in the Balkans. Relations between Austria and Serbia became increasingly bitter. Russia felt humiliated after Austria and Germany prevented it from helping Serbia. Bulgaria and Turkey were also dissatisfied, and eventually joined Austria and Germany in the First World War. The military alliances leading to World War; The Triple Entente in green; The Triple Alliance in brown. The main causes of World War I, which broke out unexpectedly in central Europe in summer 1914, included many factors, such as the conflicts and hostility of the four decades leading up to the war. Militarism, alliances, imperialism, and ethnic nationalism played major roles. However the immediate origins of the war lay in the decisions taken by statesmen and generals during the Crisis of 1914, which was sparked by the assassination of Archduke Franz Ferdinand (the Archduke of Austria Hungary) by a Serbian secret organization, the Black Hand. By the 1870s or 1880s all the major powers were preparing for a large-scale war, although none expected one. Britain focused on building up its Royal Navy, already stronger than the next two navies combined. Germany, France, Austria, Italy and Russia, and some smaller countries, set up conscription systems whereby young men would serve from 1 to 3 years in the army, then spend the next 20 years or so in the reserves with annual summer training. Men from higher social statuses became officers. Each country devised a mobilisation system whereby the reserves could be called up quickly and sent to key points by rail. Every year the plans were updated and expanded in terms of complexity. Each country stockpiled arms and supplies for an army that ran into the millions. Germany in 1874 had a regular professional army of 420,000 with an additional 1.3 million reserves. By 1897 the regular army was 545,000 strong and the reserves 3.4 million. The French in 1897 had 3.4 million reservists, Austria 2.6 million, and Russia 4.0 million. The various national war plans had been perfected by 1914, albeit with Russia and Austria trailing in effectiveness. All plans called for a decisive opening and a short war. The long-term French reaction to defeat in the Franco-Prussian war of 1870-71 was Revanchism: a deep sense of bitterness, hatred and demand for revenge against Germany, especially because of the loss of Alsace and Lorraine. Paintings that emphasized the humiliation of the defeat came in high demand, such as those by Alphonse de Neuville. French foreign policy was based on a fear of Germany—whose larger size and fast-growing economy could not be matched—combined with a revanchism that demanded the return of Alsace and Lorraine. Apart perhaps from the German threat, most Frenchmen ignored foreign affairs and colonial issues. In 1914 the chief pressure group was the Parti colonial, a coalition of 50 organizations with a combined total of 5000 members. 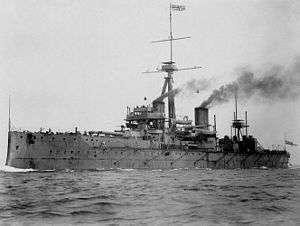 The British Dreadnaught (1906) made all battleships obsolete because it had ten long-range 12-inch big guns, mechanical computer-like range finders, high speed turbine engines that could make 21 knots, and armour plates 11 inches thick. After 1805 the dominance of Britain's Royal Navy was unchallenged; in the 1890s Germany decided to match it. Grand Admiral Alfred von Tirpitz (1849 – 1930) dominated German naval policy from 1897 until 1916. Before modern Germany formed in 1871, Prussia never had a real navy, nor did the other German states. Tirpitz took the Empire's modest navy and turned it into a world-class force that could threaten the British Royal Navy. The British responded with new technology typified by the Dreadnaught revolution, and remained in the lead. Tirpitz was thus not strong enough to confront the British in World War I; the one great naval Battle of Jutland failed to end Britain's control of the seas or break the stifling blockade it imposed on Germany. Germany turned to submarine warfare, which — along with a German message decrypted by the British in the winter of 1917 involving assistance to Mexico — antagonized the largest neutral power, the United States. The Participants in World War I. 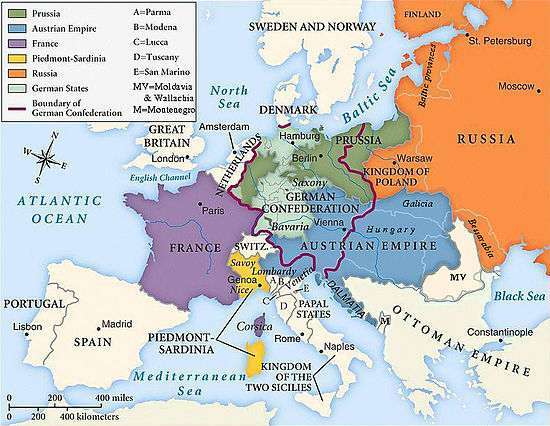 Those fighting alongside the Allies are in green, the Central Powers in orange, and neutral countries in grey. The Great War, later called World War I (or First World War in Britain), was a global conflict that lasted from 1914 to 1918. It saw the Central Powers (Germany and Austria-Hungary, later joined by the Ottoman Empire and Bulgaria), fighting and defeated by the "Entente" or "Allied" powers, led by Britain, France, (and Russia until 1917), later joined by Italy, and many other countries. The United States, initially neutral, tried to broker a settlement but in April, 1917, it declared war on Germany. The U.S. cooperated with the Allies but did not formally join them, and it negotiated peace separately. The Central Powers collapsed in November, 1918; Germany accepted an "armistice" that in practice was a total surrender. Detail from William Orpen's painting The Signing of Peace in the Hall of Mirrors, Versailles, 28th June 1919, showing the signing of the peace treaty by a minor German official opposite to the representatives of the winning powers. The major decisions were the creation of the League of Nations; the five peace treaties with defeated enemies (most notably the Treaty of Versailles with Germany); heavy reparations imposed on Germany; the awarding of German and Ottoman overseas possessions as "mandates", chiefly to Britain and France; and the drawing of new national boundaries (sometimes with plebiscites) to better reflect the forces of nationalism. In the "guilt clause" (section 231), the war was blamed on "aggression by Germany and her allies." Germany only paid a small fraction of the reparations before they were suspended in 1931. ↑ Heinz Waldner, ed. (1983). The League of Nations in retrospect. Walter De Gruyter. p. 21. Retrieved 2016-02-24. ↑ C.W. Crawley, "International Relations, 1815-1830" in C.W. Crawley, ed., The New Cambridge Modern History: Volume 9, War and Peace in an Age of Upheaval, 1793-1830. Vol. 9 (1965) pp 669-71, 676-77, 683-86. ↑ Henry Kissinger, A World Restored: Metternich, Castlereagh and the Problems of Peace, 1812–22 (1957). ↑ Gordon Craig, "The System of Alliances and the Balance of Power." in J.P.T. Bury, ed., The New Cambridge Modern History, Vol. 10: The Zenith of European Power, 1830-70 (1960) p 266. ↑ Frederick B. Artz, Reaction & Revolution: 1814–1832 (1934) p 170. ↑ Paul W. Schroeder, The Transformation of European Politics: 1763–1848 (1996) p 800. ↑ Boyd Hilton (2006). A Mad, Bad, and Dangerous People? : England 1783-1846. Oxford U.P. pp. 290–93. Retrieved 2016-02-24. ↑ Falola, Toyin; Warnock, Amanda (2007). Encyclopedia of the middle passage. Greenwood Press. pp. xxi, xxxiii–xxxiv. ISBN 9780313334801. ↑ John Lynch, ed. Latin American Revolutions, 1808–1826: Old and New World Origins (1994), scholarly essays. ↑ Henry Kissinger, A world restored: Metternich, Castlereagh, and the problems of peace, 1812-22 (1957) pp 286-311. ↑ Paul Hayes, Modern British Foreign Policy: The nineteenth century, 1814-80 (1975) pp 155-73. ↑ Douglas Dakin, Greek Struggle for Independence: 1821-1833 (U of California Press, 1973). ↑ Carl C. Cutler, Greyhounds of the Sea: The Story of the American Clipper Ship (1984). ↑ William Bernstein (2009). A Splendid Exchange: How Trade Shaped the World. Grove/Atlantic. pp. 326–28. Retrieved 2016-02-24. ↑ Craig L. Symonds; William J. Clipson (2001). The Naval Institute Historical Atlas of the U.S. Navy. Naval Institute Press. pp. 72–74. ↑ Tom Standage, "The Victorian Internet: the remarkable story of the telegraph and the nineteenth century's online pioneers," (1998). ↑ Jill Hills, The struggle for control of global communication: The formative century (2002). ↑ Simone Müller, "The Transatlantic Telegraphs and the" Class of 1866"—the Formative Years of Transnational Networks in Telegraphic Space, 1858-1884/89." Historical Social Research/Historische Sozialforschung (2010): 237-259. ↑ Hull, Isabel V. (2014). A Scrap of Paper: Breaking and Making International Law during the Great War. Cornell University Press. p. 17. Retrieved 2016-02-24. ↑ Donald Quataert, The Ottoman Empire, 1700–1922 (2000). ↑ David Steele, "Three British Prime Ministers and the Survival of the Ottoman Empire, 1855–1902." Middle Eastern Studies 50.1 (2014): 43-60. ↑ "The Serbian Revolution and the Serbian State". ↑ Plamen Mitev (2010). Empires and Peninsulas: Southeastern Europe Between Karlowitz and the Peace of Adrianople, 1699-1829. LIT Verlag Münster. p. 147ff. Retrieved 2016-02-24. ↑ "Serbian Revolution : Negotiations Legal Status Of Serbia". ↑ A.J.P. Taylor, "The war that would not boil," History Today (1951) 1#2 pp 23–31. ↑ Orlando Figes, The Crimean War: A History (2011). ↑ A.W. Ward; G.P. Gooch (1970). The Cambridge History of British Foreign Policy, 1783–1919. Cambridge U.P,. pp. 390–91. Retrieved 2016-02-24. ↑ Derek Beales, England and Italy, 1859-60 (1961). ↑ Niels Eichhorn, "The Intervention Crisis of 1862: A British Diplomatic Dilemma?" American Nineteenth Century History 15.3 (2014): 287-310. ↑ Keith A.P. Sandiford, Great Britain and the Schleswig-Holstein question, 1848-64: a study in diplomacy, politics, and public opinion (1975). ↑ Paul H. Scherer, "Partner or Puppet? Lord John Russell at the Foreign Office, 1859–1862." Albion 19#3 (1987): 347-371. ↑ A.J.P. Taylor, Europe: Grandeur and Decline (1967) p 64 for quote. ↑ E.E.Y. Hales (1954). Pio Nono: A Study in European Politics and Religion in the Nineteenth Century. ↑ ...Italy sixth great power..
↑ Frank J. Merli; David M. Fahey (2004). The Alabama, British Neutrality, and the American Civil War. Indiana U.P. p. 19. Retrieved 2016-02-24. ↑ J. V. Clardy, "Austrian Foreign Policy During the Schleswig-Holstein Crisis Of 1864: An Exercise in Reactive Planning and Negative Formulations," Diplomacy & Statecraft (1991) 2#2 pp 254-269. ↑ Don H. Doyle (2014). The Cause of All Nations: An International History of the American Civil War. Basic Books. p. 303. Retrieved 2016-02-24. ↑ He adds, "All the rest were maneuvers which left the combatants at the close of the day exactly where they had started. A.J.P. Taylor, "International Relations" in F.H. Hinsley, ed., The New Cambridge Modern History: XI: Material Progress and World-Wide Problems, 1870-98 (1962): 554. ↑ T. G. Otte, "From 'War-in-Sight' to Nearly War: Anglo–French Relations in the Age of High Imperialism, 1875–1898," Diplomacy & Statecraft (2006) 17#4 pp 693-714. ↑ Robin Hallett, Africa Since 1875: A Modern History, (1974) p. 560. ↑ John M. Mwaruvie, "Kenya's 'Forgotten' Engineer and Colonial Proconsul: Sir Percy Girouard and Departmental Railway Construction in Africa, 1896–1912." Canadian Journal of History 2006 41(1): 1–22. ↑ Charles Ralph Boxer, The Portuguese seaborne empire, 1415-1825 (1969). ↑ David Wolff; John W. Steinberg (2007). The Russo-Japanese War in Global Perspective: World War Zero. BRILL. Retrieved 2016-02-24. ↑ George Kerr, Okinawa: The history of an island people (Tuttle Publishing, 2013). ↑ Hilary Conroy, The Japanese seizure of Korea, 1868-1910: a study of realism and idealism in international relations (1960). ↑ Turan Kayaoglu, Legal imperialism: sovereignty and extraterritoriality in Japan, the Ottoman Empire, and China (Cambridge University Press, 2010). ↑ David McLean, "Finance and 'Informal Empire' before the First World War," Economic History Review (1976) 29#2 pp 291–305 in JSTOR. ↑ Duane Niler Pyeatt, "Heligoland and the making of the Anglo-German colonial agreement in 1890 (MA thesis Texas Tech University, 1988) online Archived November 1, 2014, at the Wayback Machine. ↑ Gladstone, Bulgarian Horrors and the Question of the East (1876) online edition Disraeli wisecracked, of all the Bulgarian horrors perhaps the pamphlet was greatest. ↑ T. G. Otte, "From 'War-in-Sight' to Nearly War: Anglo–French Relations in the Age of High Imperialism, 1875–1898," Diplomacy and Statecraft (2006)17#4 pp 693–714. ↑ Jack Beatty (2012). The Lost History of 1914: Reconsidering the Year the Great War Began. Bloomsbury Publishing. p. 59. Retrieved 2016-02-24. ↑ Henig (2002). The origins of the First World War. London: Routledge. ISBN 0-415-26205-4. Crfaig, Gordon. "The System of Alliances and the Balance of Power." in J.P.T. Bury, ed. The New Cambridge Modern History, Vol. 10: The Zenith of European Power, 1830-70 (1960) pp 246-73. Evans, Richard J. The Pursuit of Power: Europe 1815-1914 (2016), 934pp. Taylor, A.J.P. "International Relations" in F.H. Hinsley, ed., The New Cambridge Modern History: XI: Material Progress and World-Wide Problems, 1870-98 (1962): 542-66. Gallagher, John and Robinson, Ronald. "The Imperialism of Free Trade", Economic History Review (1953) 6#1 pp 1–15. Deconde, Alexander, et al. eds. Encyclopedia of American Foreign Policy 3 vol (2001), 2200 pages; 120 long articles by specialists. Findling, John, ed. Dictionary of American Diplomatic History 2nd ed. 1989. 700pp; 1200 short articles. Sexton, Jay. "Toward a synthesis of foreign relations in the Civil War era, 1848–77." American Nineteenth Century History 5.3 (2004): 50-73.